When I’m not in the kitchen, I’m conducting a junior band. Five little saxophone, horn and cornet players come under the joint command of my partner and I once a week. We make them play “The Bare Necessities” and other jolly little tunes, and tell them off for not practising. As a treat (or, more likely, a bribe to make them practise) I occasionally make them cakes. Sometimes they do something very very good — like playing very very well in a concert — and so I make them something very very nice. These were made for such an occasion. 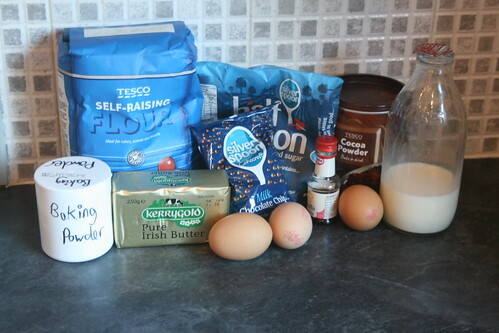 It’s a recipe from The Great British Book of Baking. I just added chocolate chips and chocolate buttercream to it. 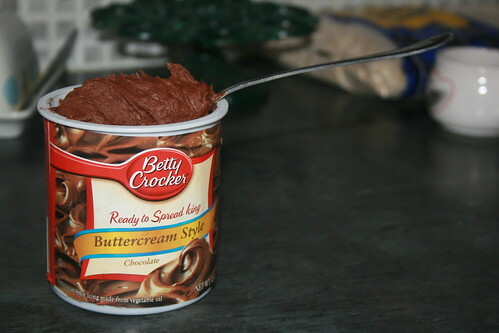 You can make your own buttercream but for this I cheated — I had some I wanted to use up. It’s very, very yummy. But beware, it’s also very, very chocolatey. Unless you have the tolerance for chocolate of an eleven year old, these may be a bit much. If that sounds like you, have them warm with a scoop of vanilla ice-cream. Lush. 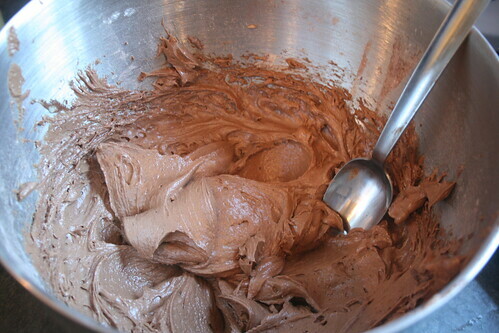 Pre-heat the oven to 180C and put the soft butter, sugar, beaten eggs and vanilla into a mixing bowl. Sift the flour, cocoa, baking powder into the bowl, add the milk and the chocolate chips, and stir until you have a smooth, thick batter. 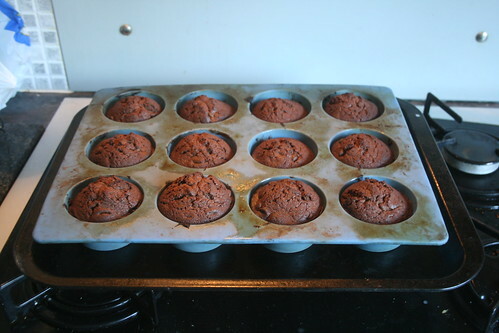 Spoon the mixture into either 24 small fairy cake cases or 12 muffin cake cases. 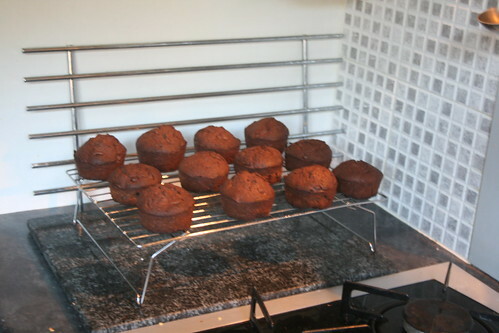 I went for the muffin cake option, purely because there were only 5 juniors to feed. 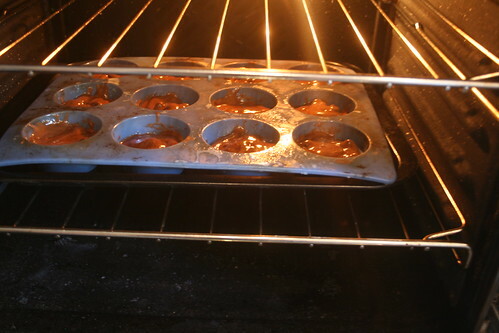 Then pop the tray in the oven. They need to bake for 15-20 minutes, until the sponge is firm and springs back when pressed. They will also smell absolutely amazing. Leave them in the tray for five minutes, then turn them out and pop them onto a wire rack. If you want to squirt a little squirty cream on top of one and eat it whilst it’s still warm, with the cream melting down the sides and the chocolate chips oozing onto your tongue, it’s okay. I promise I won’t tell anyone. Finish by smearing a generous splodge of icing over the top of each cake. They don’t look like much, but they taste divine. The Juniors were falling over themselves to get them. 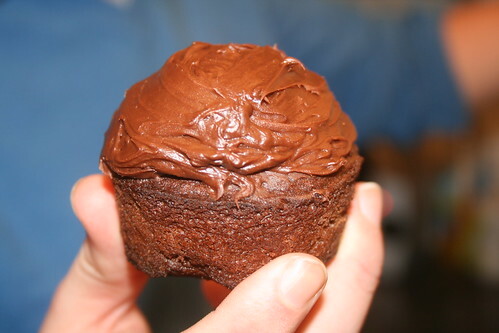 Light, chocolatey sponge with chunks of chocolate nestled in the middle…mmm.